Sealed tenders are invited for procurement of Integrated multimedia Software/Hardware for training in CNC programming and Training Software/ Hardware-class room version up to 12 user licenses plus 1 master with permanent License. This procurement should be compatible with the latest requirements of the industry. 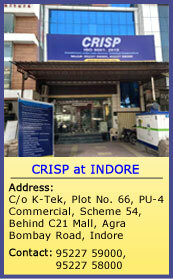 Further details of procurement may be downloaded from our website www.crispindia.com Tenders complete in all respects shall be received at CRISP counter by 4:00 p.m. on 21st February, 2017.CEO, CRISP reserves the right to cancel any or all bids without giving any reason.